In the past, IP cameras used to be the only camera you were able to view through the web, and it wasn't always an easy task. Today, local and remote access to entire systems through the network has become as easy as pie whether you have analog or IP cameras. The big difference here is that IP cameras still remain as the only option for single camera access without the use of additional hardware. What kind of hardware are we talking about? Well, for analog systems (SD & HD), you're easily able to access your cameras by going through the device they're connected to. You'll find these devices to either be a standalone digital video recorder (DVR), or a DVR card being used with a computer (PC). With an IP camera, you won't need anything else in addition to it in order to connect to your video feed. Assuming the camera has been configured, and after connecting it to you network (router/modem/switch), you're ready to begin viewing the video feed. Without first being connected to a DVR, the only other way you're going to be able to do this with an analog camera is by connecting it to a video encoder. Either way, IP cameras are still the only type that can be accessed all on their own without any extra help. Standard definition analog camera resolutions are a very touchy subject as the industry has been cluttered with confusion and misinterpretations for decades. A majority of professionals in the CCTV industry will tell you that there is no available resolution for standard definition security cameras above 700 TV lines (TVL). That being said, you will see plenty of these types of cameras being advertised as high as 1000TVL. The reason why isn't nearly as important as the fact that even at its highest resolution, standard definition analog camera do not even come close to comparing with even the lowest resolution high definition cameras. That makes high definition analog cameras are next on the list. These types of cameras include AHD, HDCVI, HDSDI, and HDTVI. At this time, the highest resolution any of these cameras are offered in is 2 megapixels (MP). In addition to 2MP, they're also offered in 1 and 1.3 megapixels. For those of you looking to make some kind of comparison, 1.3MP will put you at 720p, and 2MP will put you at 1080p. Even at these impressive resolutions, it's just the beginning of the road. High definition IP cameras seemingly have no limitations. While they're offered in resolutions as low as 1MP, they're also offered with resolutions as high as 29MP. This sends IP cameras skyrocketing passed the competition. While the vast majority of consumers won't find a lot of use for a camera over 5MP, the fact remains that the resolutions are readily available if/when you need them. Analog cameras, both SD and HD, were most commonly installed using Siamese cable, but as time goes on, we see more and more people using network cable (Cat5e/Cat6) as well. Regardless of which you may be using, it essentially means running just one cable per camera which will support both video and power. Some Siamese cable is able to be purchases with audio cable attached as well for you microphone enthusiasts. You may think this is everything you could possibly need, but there's a big camera type that this doesn't cover; standard definition and HDSDI pan tilt zoom cameras. While Siamese cable will serve in providing your PTZ type camera with power, as well as a way to transmit video, you won't be able to control the pan, tilt, zoom, or focus capabilities just yet. These PTZ cameras require an RS485, or serial data, connection in order to manipulate those functions. This will mean running an additional cable. Your remaining high definition analog cameras (AHD, HDCVI, HDTVI) do not require this connection as it is all done via the coaxial line on your Siamese cable. Other than IP PTZ cameras, almost every IP camera you'll find is going to be PoE (power over Ethernet) capable. This means that, like analog cameras, you'll only need to run a single cable for video and power. The difference is that this single cable can also transmit audio, PTZ controls, and motorized lens controls. This means that no matter what you're trying to send through your cabling, you'll still only need a single length of Cat5e/Cat6 network cable per camera. The one exception is what we stated in the beginning; most of the larger IP PTZ cameras will require their own 24V power supply and dedicated power cable. Analog cameras record to digital video recorders. That shouldn't be news for anyone. Digital video recorders will generally appear in one of two forms; standalone units, or DVR cards placed inside of PCs. Whether you have one or the other, neither presents you with the ability for storage at the site of the camera. Portable recording units are the only way for analog cameras to record “locally." They're generally about the size of a cell phone and contain a lithium battery for power, and an SD card for storage. Unlike the cameras, none of these recorders are weatherproof, so you'll need to factor in a way to keep these devices safe from the elements if you end up needing one. There other downside is that they're running on a battery and that battery life isn't infinite. Unless you have the recorder permanently attached to a power source, you're going to need to worry about charging that battery on a daily basis. 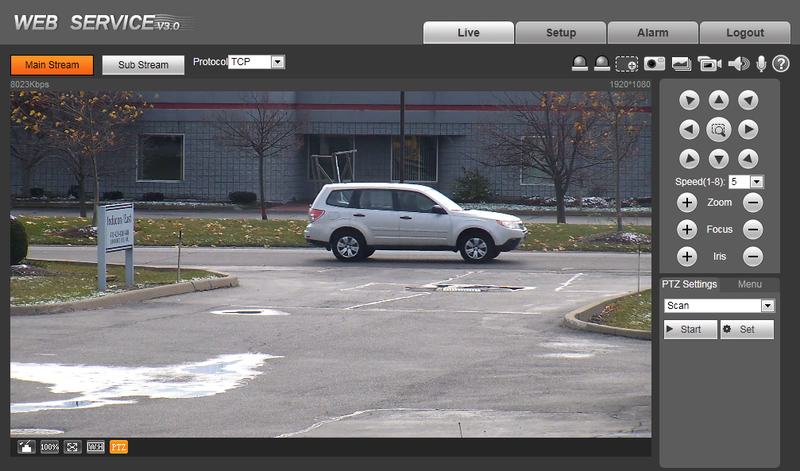 Local storage is much easier with IP cameras. Your professional level IP security cameras will usually have an upgraded model that has the ability to internally store and record to an SD card. Instead of having to worry about needing to add a portable recording device and the extra steps that come along with that, all you'll need to do is open your IP camera and place the SD card in its intended slot. From here, it's as simple as hitting the go button from any number of accessible user interfaces that have access to the camera. Of course, IP cameras are not solely limited to recording through this method.